Contact lenses "cannot get lost in the eye"
It is a physical impossibility for contact lenses to get lost behind the eye, and a myth which needs to be debunked, one source has stated. 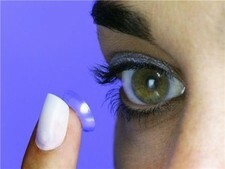 Within a list of contact lens myths compiled by NewsMax.com, the website noted that many people believe that it is possible for contact lenses to become dislodged and roll behind the eye, but this is untrue due to the anatomy of the optical cavity. It explained: "The anatomy of the eye is such that it does not allow even the tiniest entity to get lost behind it. The membrane protecting the eye acts as an efficient barrier to prevent the lens from slipping behind the eye." Another common misconception about contact lenses is that they cost a lot, but they are in fact relatively inexpensive when compared to other forms of vision correction, the source added. Also recently, retired optometrist Dominic Devlin told the Daily Mail that contact lenses are likely to cause fewer problems than undergoing an operation to correct people"s vision.